Close to water, historic Charlottetown 3-bdrm, private garden and parking! Imagine being in the centre of the action in Charlottetown's heritage district enjoying a house built in 1870 for the first harbourmaster of the Charlottetown Harbour. Two blocks from the Charlottetown waterfront where Canada Day is celebrated and there are many cafes and shops. Walking distance also to Victoria Row, a pedestrian mall with live music, restaurants, galleries and chess board picnic tables! This licensed tourist home is in the heritage zone of Charlottetown, a Canadian cultural capital. The 'Fathers of Confederation' began the process of forming Canada in this neighbourhood. Explore our history on historic Great George St and Province House. Costumed interpreters re-enact conversations from that time. There are boat, double decker bus and horse & buggy tours within the neighbourhood. The house has spacious rooms and hardwood floors. Lots of comfortable furniture and spaces to relax. Fully equipped including barbecue supplies, beach towels and chairs and kid's supplies. The house comes with one parking space, plus more parking on a one-way street and a private garden! We have been entertaining guests from around the world for 12 years and hope to add you to the list! This is our 11th year renting out our home during the summer months. We have met families, couples, 3 generations, conference delegates from all over the world. We're happy to provide a home away from home. We get great feedback on the location and the fact that people can walk and not struggle for parking. Our guests seem to love barbecuing and are grateful for the supplies. The garden is a sweet gem - private with chairs, tables and umbrellas. There is a little, glassed-in room on the 2nd floor that looks out over the street and guests enjoy reading and relaxing there. The house is stocked with books, magazines and games and that's a hit too. The upstairs bathroom has a 6 foot clawfoot tub, separate shower, pedestal sink and toilet. The main floor half-bath has a toilet and sink. Harbourmaster House is 2.5 blocks from the harbour front area of Charlottetown. There is an A/C on main floor and 2nd floor Master bedroom. Due to thick walls, house rarely gets warm in summer. Parking for one vehicle. Second vehicle can park on other side of our one-way street. It's our experience that people travel with cell phones, so we do not have a phone. We do provide Wi-Fi. The kitchen is fully loaded with dishes, glassware, pot and pans, dish towels, supplies for dishwasher and hand washing, paper towels/napkins, coffee filters for coffee maker and drawer of spices! There is a TV in the living room where you can access Netflix and YouTube. We have lots of beach toys and backyard games. Table, 2 umbrellas and 6 chairs for dining in the garden. We have 17 wooden stairs between the upstairs and downstairs. We can put gates on for young children. We ask that people smoke outside. Excellent location to tour PEI. Our family of six enjoyed the history, location and spatial amenities of this home. To be within walking distance to all the tourist areas, restaurants and services in Charlottetown was amazing. Very clean and spacious. Centrally located to explore the island with many day trips for kayaking, national park exploration, and beach activities. Karen was quick to assist with any questions and was a great resource for local activities. We will remember our first trip to PEI for many years to come! Thank you Karen for sharing your home with us. Sincerely appreciated. Karen's home exceeded our expectations and we had a wonderful experience. The home is located right in the heart of Charlottetown; close to restaurants and activities. The home is clean and welcoming! I would definitely stay again!! Rented this beautiful home right in downtown Charlottetown for 5 days and used it as a hub to explore the entire island (drove every piece of it). Everything within striking distance and nice to return home back the 'big city' in the evening for a nice meal. The waterfront is a 5 minute walk and ditto for numerous restaurants. It was nice to bbq in the backyard and found the house had ample space to relax/lounge in. I would come back here again and beats staying at a hotel as you can set up house here like you would back home. We were so happy to call this our home during our stay in Charlottetown! It is in an ideal location, walking distance to the downtown core and to the harbor. The house is full of charm, warmth and history! There was plenty of space inside for our family of 5 and the back yard was quiet, private and beautifully landscaped. My husband enjoyed cooking on the brand new barbeque! The owners were also very gracious and accommodating. If our travels bring us back to Charlottetown again, we would definitely love to stay in the Harbor house. We're delighted you enjoyed your stay at HarbourMaster House. We try to provide a great location and comfortable home as well as the little things that make a vacation a success. We're glad you appreciated the history of our home and neighbourhood. In 12 years we've opened our doors to families and couples from around the world. It's great fun! A perfect spacious and clean house convenient to everywhere in town, many beach options close by. Quiet at night despite being only blocks from all the action. Highly recommended! Thank you so much. We always look forward to seeing you! Fabulous place to stay. Close to everything. 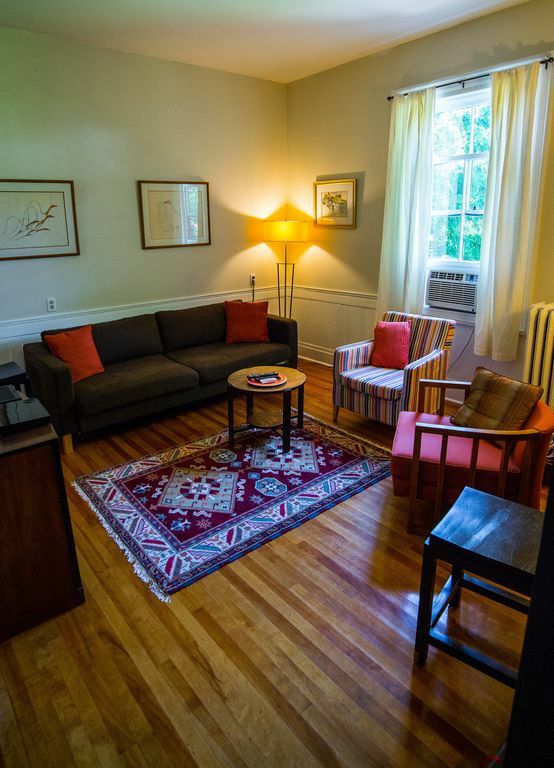 This is the perfect place to stay in Charlottetown. Great location, well stocked kitchen and lovely garden to relax and BBQ in the evenings. We highly recommend staying here and will definitely be back. Thank you so much for letting us stay in your beautiful home. Our children now want to move there! I think that sums up how great this place is. There are books galore and games. Our children didn't want to go anywhere and were quite happy just to relax and wander down the road for an ice-cream. Thank you for such a lovely review! It's wonderful to have guests who are curious about where they're visiting. This family made good use of the house as a base for outing and for enjoying Charlottetown. We hope you do return! Harbour Master House is located in the heritage area of Charlottetown, the capital of PEI. This is where the Father's of Confederation decided to form Canada. It's 2 blocks from the waterfront, a stroll to the Provincial Legislature, National Art Gallery, Theatres, shops, antiques and galleries, restaurants, tours on land and water, live music and clubs. A lovely area to stroll. You are a short drive to beaches, harness racing, the National Park with parabolic dunes, award winning golf courses, deep sea fishing, lobster dinners and Anne of Green Gables country. Guests appreciate that they are not far from anything yet can enjoy a well appointed home and garden in quiet privacy. The house is also a great base for enjoying Canada Day Celebrations, Art In The Open, the PEI Jazz and Blues Festival and the International Shellfish festival.